– Remove the clay from its packaging and knead for 3-4 minutes until it is soft. Insert the soft clay into the bottom frame and use the provided rolling pin to spread it evenly. – Gently press the baby’s hand and foot to make the prints and then let the clay dry for 48 hours. – Cut a picture to match the heart shaped frame and enjoy the result! LOVELY BABY SHOWER GIFT: Original gift idea for a christening, a baby shower, a baby’s birthday party or a visit to a mum to be. This lovely photo frame will impress everyone! CREATE AN EVERLASTING MEMORY: This new born baby frame is all you need to create an everlasting memory of your little boy or girl, a keepsake that will last a lifetime! 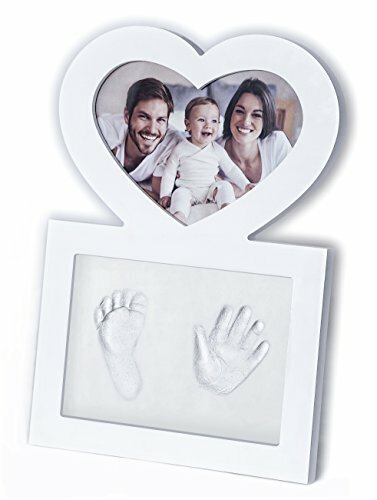 UNIQUE DESIGN: The handprint & footprint frame features an elegant heart shaped design ideal for a family picture! The frame can be wall mounted or table rested. SAFE AND EASY TO USE: Together with the picture frame you will receive 2 bags of clay, a rolling pin and an instruction book . The clay is safe and easy to use, you just need to let if dry for 48 hours after taking the prints. ENJOY A 100% RISK FREE PURCHASE: Keeping you satisfied is our number one goal. In case this picture frame kit does not live up to your expectations, we will offer you all your money back.